Elizabethan Holidays: Christmas... and Plough Monday? The Twelve Days of Christmas, from December 25 to January 6, was the longest and most enthusiastically celebrated festival in the Elizabethan calendar. On Christmas Eve, people decorated with evergreens, ivy, and holly, burned a Yule log, sang carols, and visited neighbors. Wassail was dispensed by groups who carried the cauldron of beer and roasted apples from door to door. Presiding over the revelries throughout the twelve days was the Lord of Misrule, a clownish figure appointed to organize the entertainments, which could include plays performed by traveling mummers and games of chance or skill. Gifts were exchanged on New Year’s Day. Traditional presents included an orange stuck with cloves or a modest piece of ginger but, as evidenced by the palace’s gift rolls, Queen Elizabeth’s haul was considerably more lavish. 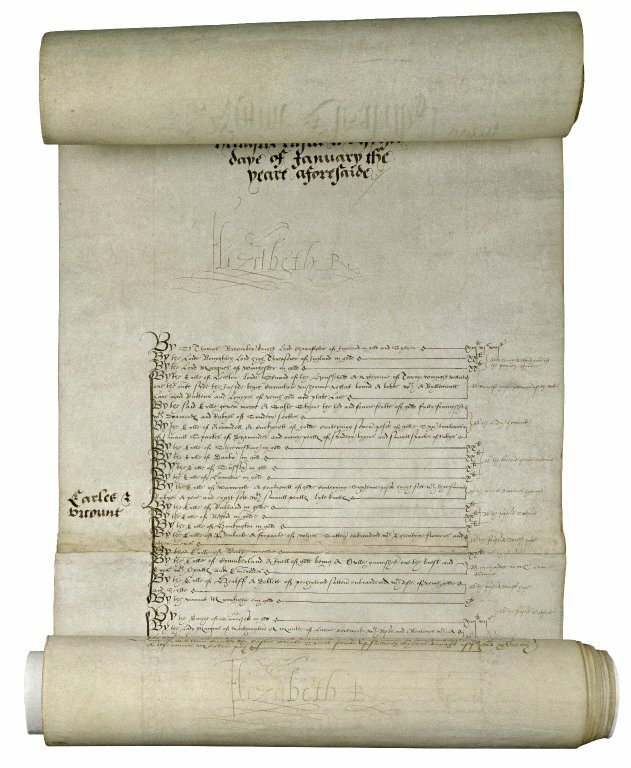 New Year’s gift roll of Elizabeth I, Queen of England. Folger Shakespeare Library. The period of revelry ended on Twelfth Night when the Lord of Misrule stepped down, but not before presenting another festive evening of music, dancing, and feasting. In the countryside, Plough Monday on January 7 signaled a return to the fields after the revels of Christmas. The day began with a competition of industriousness wherein ploughmen would try to get their whips or hatchets to the hearth before the young women could put their kettles on them. Later, amid dancing and masquerades, plowboys pulled a beribboned plow through the town to collect money for the parish. This blog post is excerpted from an article that appeared in the Fall 2012 issue of Folger Magazine. Karen Lyon is managing editor of Folger Magazine and has written on topics relating to everyday life in Shakespeare’s time, including education, clothing, food and humors, sporting games, attitudes toward animals, the role of magic, crime and punishment, and table manners (or lack thereof).